I was inspired by a chicken and mole sauce dish last night. 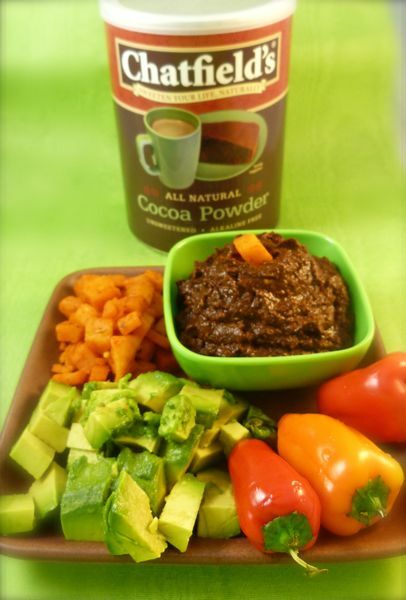 So, I made my own savory mole sauce at home this afternoon, using unsweetened (and alkaline free) Chatfield's Cocoa Powder (Manufactured for Panos Brands, Saddle Brook, NJ). Mole typically is a mix of many flavors. I used, for example, many types of fresh, dehydrated and ground chiles in this sauce (including sweet pepper, ancho, chipotle and red chiles); smoked and garlic salts; a bit of diced onion and roasted garlic; sesame and pumpkin seeds; almonds; a dab of quince paste for sweetness; a dash of fresh tomato salsa; thyme, and other herbs and spices. 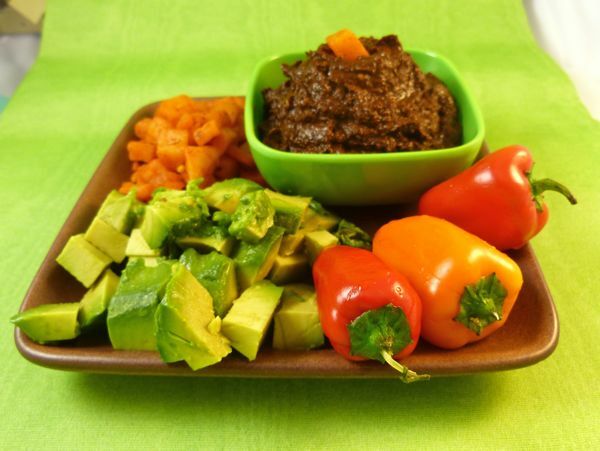 This spicy mound of dark sauce was a great accompaniment to small cubes of bbq spiced cheddar, fresh avocado pieces, fresh sweet peppers, carrots, and other cheeses. Today was Day #4 of Chocolate and Cheese Theme Week.